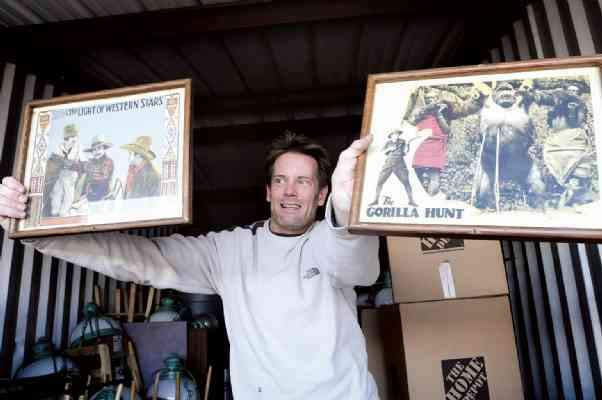 Todd Gibson, new owner of Farquahrts, shows items Wednesday that were taken off the restaurant's walls and are being stored until they're auctioned. The new owners of Farquahrts - for 35 years the place to kick back after work Friday - are going to auction locally the memorabilia that adorned the walls of the downtown Durango eatery in hopes the items will remain in the community they've adopted as their own. "We were going to sell the stuff on eBay, but so many people said, 'You remember that photo or that sign or that whatever? Well, I'd like to buy it,'" said Lisa Gibson who, with husband, Todd, are renovating the old hangout and bringing back its signature identifications - pizza and live music. "We decided to give the memorabilia back to local residents." No date is set for the auction or the reopening. But the memorabilia - stored off-site - includes chairs, lighting fixtures, metal beer signs, serving trays, photographs, paintings, the restaurant's tin ceiling, old-time movie promo photos and pages from newspapers dating to before and during World War II. 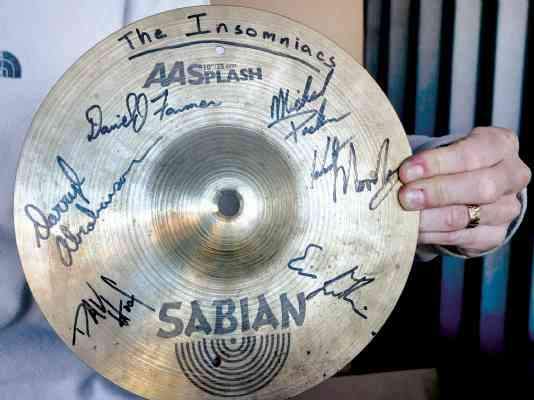 The Gibsons, who own a company in Chicago that tests calibrating equipment, want the memorabilia to remain in Durango, which they discovered 15 years ago when they came to ski. They now own a house in Bayfield. "We've skied all over - Wyoming, Nevada, Montana, California - but Durango was the only town that ever clicked. It's the coolest place," Lisa Gibson said. "The first time here, we were driving through when we had to stop to allow elk to cross the street." A few of the pieces that adorned the walls of Farquahrts were given to loyal customers, and a few others, including sections of the tin ceiling, will take their place again in the renovated establishment. The bare-brick walls will remain, but most of the ceiling - with the tin gone - will remain open, allowing diners to view wooden rafters and old porcelain electrical insulators. The Gibsons hope to seat 80 to 100 customers indoors. A rear patio is scheduled to open, perhaps in the summer. The name Farquahrts dates to 1973 when Toby Peterson and his wife, Mary Lou, bought a bar called The Pub in the 700 block of Main Avenue, rechristened it and became purveyors of pizza, spirits and live music. 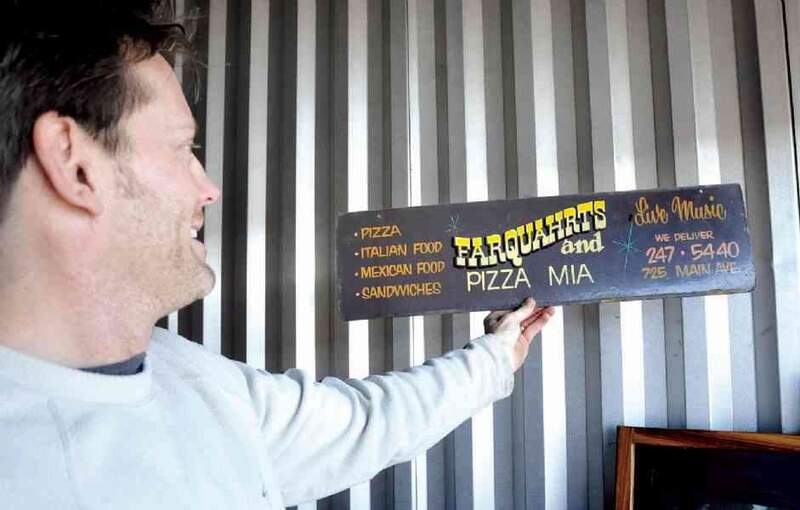 A Farquahrts at Purgatory catered to skiers from 1985 to 2000 but closed when the Petersons couldn't get the contract renewal they wanted and the downtown Durango eatery began to require more attention. But by 1998, the Farquahrts clientele had changed. The crowd was older and the taste in music changed. So the stage and dance floor were torn out to make way for a dining area, and the menu was expanded. Now, the Gibsons plan to restore the dance floor, bring in local and out-of-town bands and offer the restaurant fare of their hometown. The reduced menu will offer pizza, including 3-inch pies, hot dogs, gourmet salads and possibly burgers and fries. Peterson, who retains ownership of the building housing Farquahrts, said Wednesday he still feels an occasional twinge of nostalgia. "I'd be lying if I said I didn't feel something," Peterson said. "I renovated that building and collected all the memorabilia, some of which is valuable." But Peterson wishes the new owners well. He heard a name change may be in the works but said the decision is the prerogative of the Gibsons. "It's a young person's business," Peterson said. "Todd and Lisa have their own ideas of how the place should look. More power to them."